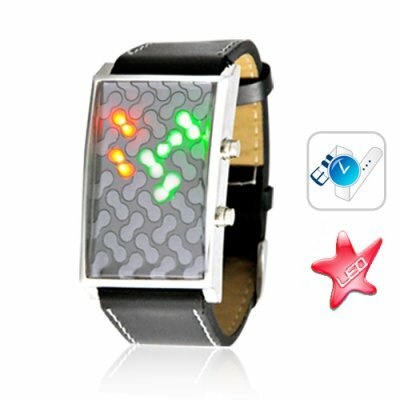 Successfully Added Genome - Japanese Style Inspired Red Yellow Green LED Watch to your Shopping Cart. Introducing The Genome, a Japanese inspired red, yellow, and green LED watch delivered via Dan Simmons' farcaster network which gives its biological entity wearer Shrike-like powers by resequencing how time tide information is posited. You mean this watch really tells the time? My lad, if all you want is a watch then yes of course The Genome tells the time, but to call this...device a watch is like calling a samurai sword a butter knife! The Genome embodies Deoxyribonucleic style and base pair design with its traffic light spectrum of red, yellow, and green molecular LED units randomly scattered (randomness generated by atmospheric noise instead of pseudo-random number algorithms typically used in computer programs!) amidst a darkly mirrored surface and then encased in Vibranium-Adamantium alloy. Tap the top button on the right side of the timepiece and watch the screen come to life like a long chain of nucleotides bubbling up from The Primordial Soup. Though it may seem like you'd have to be Mycroft Holmes to figure out what time it is - it's actually quite easy. Each red dot is one hour of time. Each yellow dot is five minutes of time. Finally each green dot is one minutes worth of time data. Five red, seven yellow, three green? It's 5:38 am! In fact, when you start wearing The Genome you may find yourself imbued with remarkable powers like the ability to easily defeat The Borg as Species 8472 did or control the dream dimension as Morpheus is able to do in Neil Gaiman's The Sandman series. You will also be able to call upon vast dark powers as Hellsing organization's Alucard is able to do. Probably your greatest ability however will be your Origami mastery over time and space like The Xeelee, allowing you to fold multidimensional realities into such shapes as frogs or the ever popular Japanese crane! Tolkien himself was known to be a wearer of a 1912 original of The Genome LED watch as was Kurt Cobain, Bruce Lee, and Princess from Battle of the Planets! In reality, this watch is perfect for Riemann Hypothesisists, Hodge Conjecturists, exotic options traders, Croatian fansubbers, Air on the G String Theory musical physicists, Springfield inhabitants, those who speak Etruscan, and fans of Stieg Larsson. Just google "Japanese LED Watch" to see how much these timepieces sell for online. Notice how they normally retail for close to 10x the price we're selling them for. Even if you don't intend on buying one for yourself, stock your online store with this headturning watch to lock in some amazing profits! Brought to you by the leader in direct from China wholesale electronics - Chinavasion. This watch is not waterproof though it is uncool proof. No matter how uncool you are, wearing the watch instantly increases your coolness factor by 5.7 Miles Davis magnititudes! How do I change the time on this watch? The batteries should last longer than with a normal watch since time information is only displayed when you want. No, it is better because it costs almost 1/15th the price of a Tokyo Flash watch and is also backed by Chinavasion's famous 12 month warranty. Why is this watch called The Genome? What are the Red, Yellow, and Green LED lights made of?The Red LED is made from Red Kryptonite, but contrary to what most people think, the green LED light however is not made from Green Kryptonite. In fact, its taken from Alan Scott's Green Lantern ring. The yellow light is from slivers of gold originally carried by three hyper-intelligent men several thousand years ago when visiting someone known as The Nazarene. You mentioned that this watch is perfect for Riemann Hypothesisists, Hodge Conjecturists, exotic options traders, Croatian fansubbers, Air on the G String Theory musical physicists, Springfield inhabitants, those who speak Etruscan, and fans of Stieg Larsson. What if I don't belong to one of these groups? This watch is also perfect for anchovies on your pizza lovers, giant iPhone also known as the iPad owners, people who hate their jobs, anyone who can sing the entirety of Open Arms by Journey, Starcraft 3 players, and people who are cheap and don't want to spend much but want to get a lot in return.